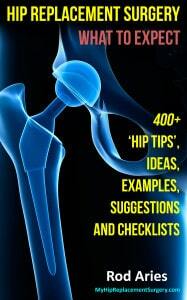 Chapter 17 – Personal Medical Issues: Timeline And Checklist – 13 Things To Do Two To Eight Weeks Before Surgery. This is a working checklist for issues related to your personal medical care you will need to address in the weeks before surgery. Dental Care – After you have a scheduled hip replacement surgery date, you will be asked to receive clearance from your dentist. Your dentist will make sure that you do not have a tooth abscess or a dental infection as the bacteria can spread to your hip and cause medical complications. Hip Tip – Dental Care Clearance: You will need to have dental care clearance at least a month in advance of your surgery. Your surgery scheduler can’t complete final surgical placement until all your paperwork is in place. Hip Tip – Lifetime Dental Infection Notice: Once you have completed your hip replacement surgery, you will always need to inform your dentist bout your hip replacement. Typically you will take antibiotics prior to major dental cleanings or invasive dental procedures. This will help to prevent any infections in your hip. Hip Replacement Class – Most major hospitals will require you to sign up for their joint replacement class, typically from two to four weeks before surgery. They will cover the procedures specific to your needs and their hospital. If you have bought this book prior to your hip replacement class, feel free to share this information with your instructor. Blood Transfusion – Your hip replacement is a major, invasive operation, and as such there is always a chance you may require a blood transfusion during the operation. While hospitals keep a supply of blood available for such a situation, your own blood is your safest alternative. Ask your orthopod if you should donate your own blood in the weeks before surgery. EKG (Electrocardiogram) – Depending on your age, risk and health you may be required to take an EKG test to identify any heart issues prior to surgery. Pre-Op Examination – Often you will have an appointment with an internist as a final check of your surgery readiness. X-Rays – Typically a set of x-rays are taken prior to surgery (the infamous ‘before and after’ photos). Smoking Cessation – Your physician may (will) direct you not to smoke prior to surgery. Buy Drugs… Lots of Drugs – If you go to your local pharmacy to pick-up your prescriptions, be sure to purchase at least two extra months of meds, since you are not going to be out and about following surgery. Hip Tip – Mail Order Medications: Look into establishing a mail order pharmacy source. This can save you time, and in many cases, money. Most HMO plans offer a lower rate for medications mailed versus medication picked-up at their pharmacy. Medications To Stop Taking – Your physician will advise you which medications to stop prior to surgery. Often these medications may include: Aspirin, Excedrin®, Ascriptin®, Ecotrin®, Plavix®, vitamin and herbal supplements, Coumadin® or warfarin, Ibuprofen, Advil®, Motrin®, Nuprin®, Aleve®, naproxen, and naprosyn. Advise your physician of your complete prescribed and over-the-counter medication list. Herbal Products To Stop Taking – I was given a list advising that I quit taking fish oil, chondroiten, flaxseed, vitamin E, St. John’s wort and glucosamine capsules. Your physician will advise you as to what you need to stop taking. Medications To Start Taking – I was advised to take iron supplements, preferably ‘slow Fe’ tablets with vitamin C to help with absorption for the 10-14 days leading up to surgery. Your health care team may recommend differently for you. Alrighty… that concludes Chapter 17.